It is true that the working conditions are not the exception, but the norm in this sector. Having said that, it has been clumsy. And it is Fawcett’s fault. The net median income in the UK is about £26,000 a year. One in five or 13 million people live in poverty in the UK. More than half of them have jobs. The five richest families own more than the poorest 20% of the population. And women are paying the price of austerity more than men. Fawcett Society denounced in 2012 that women were shouldering 70% of the budget cuts, which are especially harsh on single mothers. Yes, workers’ rights must have been respected. In addition to that, however, apparently nobody noticed that not many people in this country can spend £45 on a t-shirt. Or, even worse, they did notice but did not care because a feminist must look like a wealthy man. I’ll keep supporting the cause as well as Fawcett’s work, but I think this campaign has been clumsy and for once politicians are not the ones to blame. ‹ PreviousWho holds the responsibility to protect? And who is to be protected? We are writing to update you on the situation with regards to the allegations made in this week’s Mail on Sunday that our Whistles produced ‘this is what a feminist looks like’ t-shirts may not have been made in line with the ethical standards that Fawcett would require of any product bearing our name. We have been working around the clock to investigate these allegations since we first became aware of them on Saturday and are pleased to confirm that we have today seen expansive and current evidence from Whistles that the CMT factory in Mauritius they used to produce our ‘this is what a feminist looks like’ T-shirt conforms to ethical standards. 100% of workers are paid above the government-mandated minimum wage and all workers are paid according to their skills and years of service. The standard working week is 45 hours, and workers are compensated (at a higher rate of pay) for any overtime worked. There is a high retention of staff and employees are offered training and development. An audit into the CMT factory was carried out in October 2014 by an independent not-for-profit organisation and this did not reveal any material concerns on the working conditions, the welfare or the health and safety of workers. Workers are able to join a union and there is a union presence in the factory. 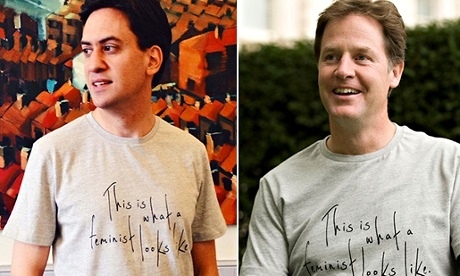 The evidence we have seen categorically refutes the assertion that the ‘this is what a feminist looks like’ T-shirts produced by Whistles were made in a sweatshop. Whilst we have confidence in the evidence provided to us, we are currently working closely with an international trade union body to scrutinise it so that we can be absolutely assured of its provenance, authenticity and that all findings are robust and factual. Further, whilst Fawcett has a UK remit, we are nonetheless acutely concerned with the inequalities women across the globe face. We recognise that investment in developing countries is vital and support this provided decent labour standards are adhered to. Many of you have sent us messages of support over the past few days and we would like to take this opportunity to say a huge thank you to those who have reached out to us, and to those who have continued to trust and support Fawcett in the face of the Mail on Sunday allegations. I’m not sure i’d say politicians aren’t to blame – ed milliband and nick clegg would support a position that says its for the consumers to make [the impossible] choices in what they consumer to wipe out sweatshops, yet they abidcate this responsibility when they’re handed a t-shirt.